Nobody wants a hot dog; a hot canine that is. 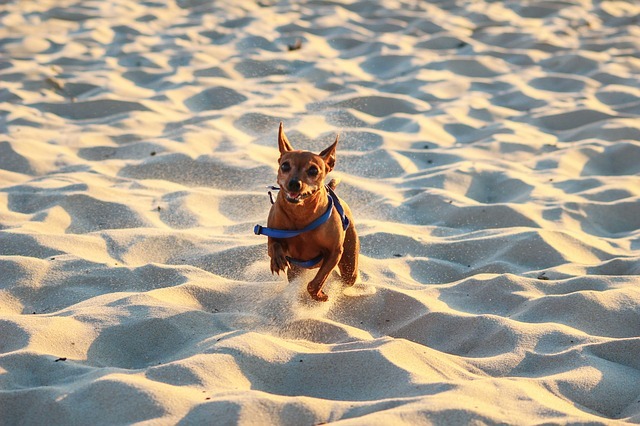 Most dogs can handle the heat, but they’ll probably need a little extra help. That’s where you come in. Let’s learn more about how our dogs handle heat, and what we can do to help. Your dog’s body responds heat differently than a human body does. Add a permanent coat into the equation, and it’s a recipe for disaster if we don’t care for the needs of our dogs in the heat. Here at BarkBlaster, we care deeply about taking care of our dogs. 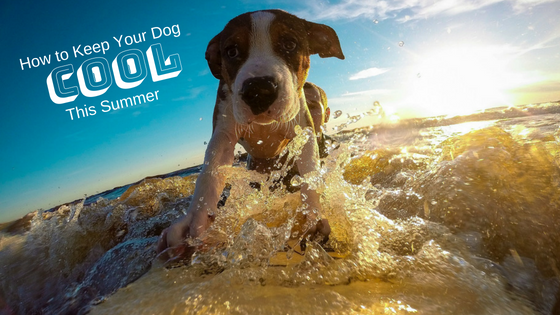 In this article we’ll help you understand the biology of how dogs keep cool, and give you some practical tips to help keep your dog cool this summer. As humans, we keep cool by sweating. It’s miraculous, when you think about it. Whenever our bodies get warm, glands all over our bodies produce extra sweat over the surface of our skin to help regulate temperature. We don’t even have to think about it. So, what about dogs? A dog’s body temperature will rise just like a human’s during stress, exercise, or excitement. Dogs have very few sweat glands, and the majority of them are located in the paws. The main tool a dog uses to keep cool in warm weather is panting. When a dog pants, the heavy breathing leads to moisture evaporation within the lungs and on their tongues. The lesser-known tool dogs use to keep cool in the heat is vasodilation. That fancy word means the expansion of blood vessels in their face and ears. This moves blood flow closer to the skin, helping the heat from within the dog exchange with outside air. Bizzare, isn’t it? Not much need for explanation on this one. If you can adjust your play and training times to either mornings or evenings, your dog will probably be much happier. They’ll be able to play and train harder, meaning your dog will probably be more well behaved and wore out by the time you get home. Always have water available. Don’t wait for your dog to look hot and tired to offer water. Staying ahead of dehydration is always the best way to go. Collapsible water bowls are an awesome, inexpensive tool to have around anytime you take your dog away from home. On extra hot days, feel free to add a few ice cubes to the water bowl. If you’re ever in a situation where shade is hard to come by, there are lots of products that can help you and your dog enjoy a break from the sun. Make sure to have a tent or umbrella handy during the warmer months. Your dog will love having a cool bed to lay on. There are specially designed cold packs/beds you can purchase just for dogs. You can also try a wet towel as an inexpensive cool bed option. Your dog will thank you! 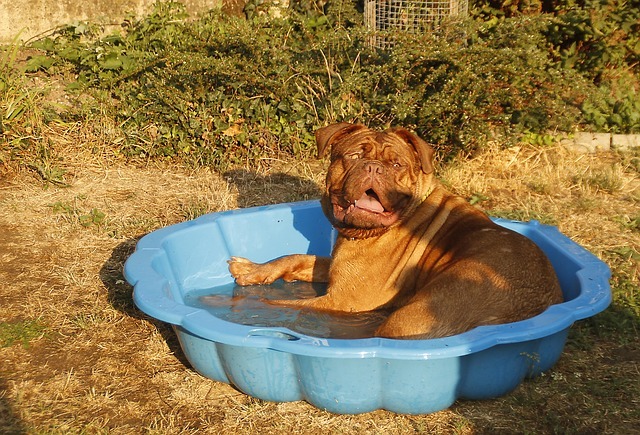 A kiddie pool is a super cheap way to keep your dog cool around the house. Also, it’s a sneaky way to give your dog a bath they might actually enjoy. There are tons of recipes online, and a few store bought options as well. Frozen dog treats can be used as a reward, or just a special treat. Either way, your dog will love them and they’ll help your dog stay cool. Check out this list of list of awesome homemade frozen dog treat ideas to get started. Give your dog a summer hairdo! Your dog will probably shed as the temperature warms up, but giving them a little extra help with a trim will be appreciated. Obviously, some of these warning signs are more severe than others. The best thing you can do is monitor your dog closely. If you see these warning signs, play it safe. Remember, your dog simply doesn’t have the heat tolerance you do. If you live in a warm climate, or can’t escape the heat for other reasons, here are a few dog breeds to consider. These breeds are great at handling the heat. Remember, it’s still very important to take the above precautions in keeping your dog cool even if your dog breed is well-suited for heat. How do you keep your dog cool in the heat? Let us know in the comments below!